Shrove Tuesday and Ash Wednesday began in Ashbourne, Derbyshire, and is one of the world's most grueling football games. 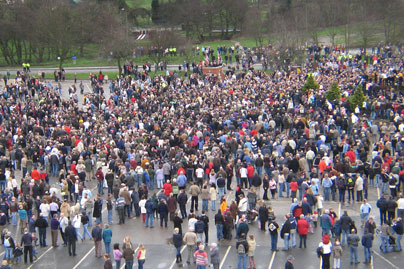 The Shrovetide football game has been played for centuries. The documents that disclosed the beginning of the annual Ashbourne Shrovetide football game where destroyed after a fire at the Royal Shrovetide Committee office in the 1890s. The earliest reference to the game is from 1683 when Charles Cotton wrote about Shrove Tuesday and Ash Wednesday. There are many different stories to the true birth of the game; the most popular theory is that the 'ball' was initially a head tossed into the crowd after an execution. There have been numerous attempts to ban the game, the most famous being in 1349 when Edward III tried to outlaw it and in 1878 the game was briefly banned after a man drowned in the River Henmore. The game has received true 'Royal Assent', in 1928 HRH King Edward VIII turned up the ball. This is when the event officially earned the designation Royal Shrovetide Football. Then in 2003, HRH Prince Charles turned up the ball. He had agreed to start the game for the two previous years but had to cancel due to Foot-and-Mouth and the death of his aunt. The only thing that distinguishes players in the two teams is their place of birth, North or South of the River Henmore, which flows through Ashbourne. If you were born north of the River Henmore you are an Up'ard, if you were born south of the river you are a Down'ard. The starting plinth is built on the Henmore and the two goal posts are located on the banks of the river three miles apart. The object of the game is to get the ball to your goal post, one at Sturston Mill (for the Up'ards) and the other at Clifton Mill (for the Down'ards). It is not possible for just anyone to goal the ball. When the ball gets within striking distance of the post, leading players decide as to who goals it. As the ball nears one of the goals, the game is paused while the ball is handed to the player selected to score. To goal a ball, the scorer stands in the River Henmore and taps the ball three times against the stone goal. The ball must not go in churchyards, cemetery's and Memorial Gardens. Do not trespass on other people's property. You must not intentionally cause harm to other players. The ball must not be hidden. The ball must not be transported in anyway. Thousands of people compete for two days with a hand-painted, cork-filled ball. The game is played over two eight-hour periods. The goals are three miles apart and there are only a few rules. There are just two teams, the Up'ards and the Down'ards. Shrovetide football has been played for centuries. It is a moving brawl which continues through the roads of the town, across fields and even along the bed of the local river. There have been intermittent attempts to ban the game but it has been played here for hundreds of years and still continues. Goals are not scored, the ball is 'goaled'. The game is not 'kicked off', the ball is 'turned up' or 'thrown up'. To goaled the ball it must be banged three times on a single post at Sturston Mill or Clifton Mill. Along with ever major sporting event there is a anthem, and there of course is one for Shrovetide football.